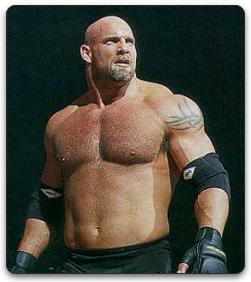 You've probably figured out by the picture above this isn't a post about the View's Whoopi Goldberg, but instead Bill Goldberg. Or just Goldberg, the former WCW and WWE world heavyweight champion. Today my thoughts on Goldberg and his "worthiness" of being inducted into the WWE Hall of Fame. Earlier this week, Triple H and Shawn Michaels were in Atlanta (site of Wrestlemania 27). The two were being interviewed and the question about the Hall of Fame came up. A lot of people are speculating the theme will be a WCW one because the company was based in Atlanta for so many years. And of course, the biggest name from the last couple of years of WCW was of course Goldberg. So naturally, fans (at least some of them) are foaming at the mouth over a possible Goldberg HOF induction. Both members of DX shot down the idea. Of course that doesn't mean a whole lot, but they went on to explain why they don't think the football player turned pro wrestler is worthy of the honor. Triple H told SB Nation Atlanta report Jason Kirk this, "We get that all the time. We call a guy to honor him in the Hall of Fame, and he goes, 'I want to do an angle. I want a one-off. I need a hundred grand," Triple H added. "So when you say, 'What about Goldberg,' no offense to Bill, but you've got guys like Bruno Sammartino that were legends with longevity that should be in there, but they're holding out because they think they've got one more run. Just using Bill as an example, how many years did he wrestle? Not many." Shawn went on to say to that he's against the idea of Goldberg going in now, not because he isn't talented but because greatness doesn't happen in a few years. Goldberg himself acknowledged Hunter and Shawn's comments and said they were entitled to their opinion. He went on to say, "They do have a point if induction is based on tenure." I have to agree with the former tag team champions on this one. For starters, I was never a big fan of Goldberg. Personally, I thought WCW crammed him down our throats as a way to fight the Stone Cold Steve Austin craze that was sweeping the wrestling world in the late 90's. Goldberg's time in the squared circle was short. He was with WCW from 1997 to 2001. He wrestled briefly in Japan for about a year, and then spent about a year in the WWE, where he won the world title ironically from Triple H.
Unless I'm mistaken his match with Brock Lesnar at Wrestlemania 20 was his last. That would give him a little less than seven years in the ring. Does that make him worthy of the Hall of Fame? Maybe eventually, but not now. When you've got guys like Bob Backlund, Bruno Sammartino, Randy Savage, and the Road Warriors not inducted, I don't believe Goldberg should be in there. But on the flip side, there are some names in there that probably don't "deserve" to be. No offense, but Koko B. Ware comes to mind immediately. Pete Rose, William Perry, and Bob Uecker too. I'm not a fan of the "celebrity wing." That being said, I think it depends your prospective. After all this is a hall of fame for a "sport" with a determined finished. WWE controls how the matches end, they control who gets into their hall of fame. It is one of my favorite parts of the Wrestlemania weekend. I know it's something the wrestlers take serious, but is it something fans take serious? I kind of feel like Hulk Hogan and to an extent Ric Flair turned their back on the concept when they did the whole angle with their rings and Abyss earlier this year. Epic failure in my opinion. According to a poll on the Bleacher Report 38% of fans said "no" to Goldberg being inducted into the HOF. 36% were in favor. The rest said not yet, but maybe in the future. I'd say that's the category I fall into. Although his tenure was short in comparison to most of the men and women in the Hall of Fame, I do think he made a significant impact on wrestling, whether you're a fan of his or not. For some reason I was thinking about this post today and had the following thought, if you discredit Goldberg from the HoF because of his length of time, do you apply that to the Rock as well? I may be mistaken, but I think the Rock's active full time career was maybe only a year or so longer than Goldberg's. Glad you mentioned it. I was actually thinking about that as I was writing the blog. Again, I don't think Goldberg should never go into the HOF, I just don't think now is the time. I also feel like Austin was inducted too soon. And it's too early for the Rock too. I like the guys from the 70's and 80's going in. Hogan vs. Flair: Who Was 'the Man'?